Every workplace must have an Emergency Plan and Evacuations Diagrams. If you are a standalone site, which would include workshops that are joined together but with direct external access, then the business would be responsible for the costs. 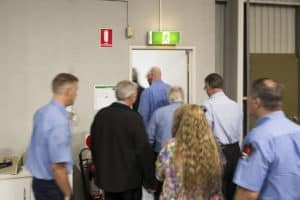 For large buildings that have common stairs, foyers and lifts then this program should be coordinated by the building owner, landlord, property manager or strata manager. We would expect that the cost for this would be in part paid for by each business according to the area of the building they occupy. It would also be expected that they make staff available to act as wardens and undertake training (including fire drills). If you are unsure of how to handle your specific location then give us a call and we will be happy to advise. Do I need to have an Emergency Plan and Evacuation Diagrams? I’m a tenant in a larger building, do I need to prepare the Emergency Plan and Evacuation Diagrams or does the Landlord/Owner/Strata Manager? This article will provide an answer to both of these questions. Division 4 of the South Australian Work Health and Safety Regulations require that every workplace has and maintains an Emergency Plan. The penalties for failing to provide and Emergency Plan can be up to $6,000 for an individual, such as a business manager and $30,000 for the business or strata corporation. That’s a lot of money! And what you are required to do is not that costly and has the potential to save lives. Procedures for responding to emergencies. These emergencies include bomb threat, armed intruder/hold up, flood and fire. 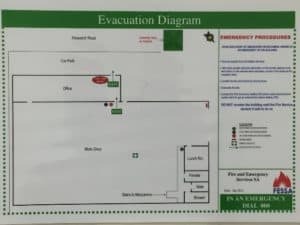 Evacuations diagrams showing staff and visitors how to respond to an emergency and their nearest exits. To assist in getting you started FESSA have developed a generic template that meets the requirements of AS3745: Planning for emergencies in facilities. By complying with this standard you guarantee that you comply with the Work Health and Safety Regulations. We can also provide you with a generic template for preparing evacuation diagrams. 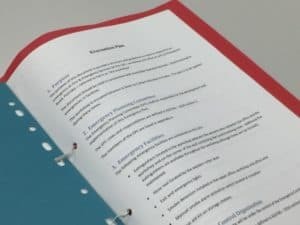 The above two “templates” are the low cost options that many small business are looking for, alternatively you can engage us to walk you through the process and prepare the Emergency Plan and Evacuations Diagrams customised to your workplace. If you want to get the templates or have us to walk you through the process contact our office on 08 8262 9245. So what are the answers to the questions?